I said it before, I love these types of pictures. To be able to see others surroundings is wonderful to me. Love it. Great Picture. Really interesting. You certainly have everyone's curiousity up. For some reason towers like that always seem so imposing and scary to me--it IS an interesting photo, though! Nice picture. I love all the clouds. cool shot. but I have the same questions everyone else does, what is it? where is it? Awesome. Where is it from? My first thought was "Watch out for lightening!" For some reason this felt melancholy to me. Very fraught with emotion. Nice shot from that distance. It is an interesting image to see just after looking at weather warning. Wow, I'm chiming in too. What is it? Space Age! New and timeless somehow. Great! Where and What? Dyin' to know! That looks imposing. 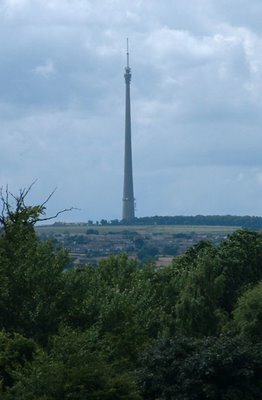 Is it a tv mast? wow, beautiful, where is that?